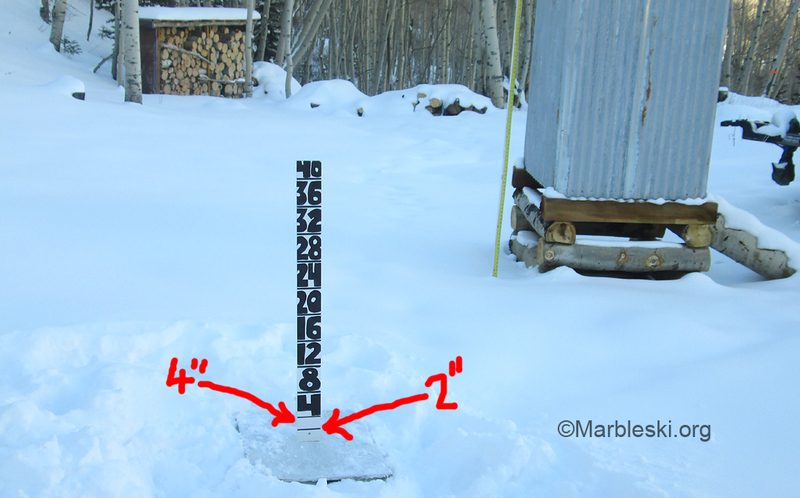 The snow “stake” or “snow board” is marked every 4 inches (10 centimeters), with the bottom increment divided at the 2 inch mark. Main thing is the numbers are ABOVE their corresponding marks. In other words, if you see the number “8” and snow below it, that’s 8 inches of snow. NEW THIS SEASON OF 2018-2019: Due to sponsorships from The North Face and Cripple Creek Backcountry, we have installed a solar powered dish heater on the Hughes Net dish. This has been complex and challenging, might be an ongoing project, but we’ve made a good start. Our webcam updates around 7:00 am, and shoots a couple of still shots. Ironically, during heavy storms the system may not work due to snow blocking the signal on our internet satellite dish. If this occurs, figure a snowfall event is happening. If necessary, to view latest image clear your browser cache. Location is at 9,000 feet near Marble Peak, in the aspen forest below the road area where most people park for skiing and hiking. Bear in mind that in early winter we sometimes get significantly more snow accumulation just 500 to 1000 vertical feet above here, due to it raining instead of snowing at the webcam location. Storm board measurement numbers are ABOVE their marks. In other words, the dark horizontal mark below the inch number is the actual measurement mark. For example, if you see the number “4” with the snow up to the black mark below the “4” that is 4 inches on the storm board. If someone is around to do it, the board will be cleaned after the morning image is captured, so what you’ll see in that situation is the prior night and prior day’s snow accumulation. If nobody is around to clean the board, just view the sequence of photos to get an idea of what’s been going on in terms of snow accumulation. Note the overall depth scale on the structure to the right of the storm board. Cam was cleared Feb 22 PM, another 8 inches showing this morning of Feb 23, 2015. Storm totals over last 48 hours are quite substantial, more like the Marble we know and love. Cleaned board around 13:00 on Friday, 27th, turned on the cam for a record shot. See the photo sequence. Morning of March 1, 2015, been getting consistent dumps now for quite a few days. Big storm slabs most certainly hanging up there, we’ll see what comes down. Expecting Mud Gulch to run over the road any day now. When the camera gets covered with snow…go skiing in safe areas. Camera didn’t work this morning of Nov 5, sat dish probably got too much sticky snow on it! Actually, it did work! Apparently we need to figure out a way to do better cache busting as my browser just kept showing yesterday’s images. Frustrating. Know you can bust cache by leaving a comment, or so it seems. Ah, the yearly dance for Marbleski, setting up the webcams. Check out the new views for 2016-2017, and we’re attempting to curate the images in a more organized fashion. Another 8 inches at 9,000 feet, with quite a bit of rain and sleet before that. I’d venture to say that above 10,000 feet we’ve got some reasonable accumulation now. Looks like another storm mid-week. That means a good TWO FEET of snow in the last 48 hours or so. Cleaned off board this afternoon of December 9. Time stamps are accurate. Huge storm this past couple of days, cam might not work this morning of January 6 and is only showing morning of January 5. Time stamps on the photos are messed up again… date captions on the thumbnails are correct. This early winter of 2017-2018 is off to a slow start — just a few inches snow on the ground so far here at 9,000 feet. Up at Marble today, upgraded the sat internet to faster better equipment that is said to do a better job of penetrating snow on dish. We’ll see how that works. We got the camera aimed and lots of measurement graphics to tell the story. Enjoy. We got 8 inches this past 24 hours, December 22 morning cam shot didn’t work due to snow on the dish, we’ll be trying some things to get rid of that problem, dish cover or heater. It’s that time of year again! Got the cam working this morning of October 23 2018. Unfortunately appears to have rained instead of snowed up there. New this year, thanks to The North Face and Cripple Creek, we have installed a solar powered dish heater. Idea is this will switch on every morning some time before the satellite transfer takes place, hopefully removing snow that blocks the dish from operation. It’s been somewhat complex building this thing, requires quite a bit of power, so we’re not sure our battery capacity and PV panels are up for it. Seemed to work during testing last winter, but actually melting snow off the installed dish might be more demanding than math and testing can predict. Cam appears to be working, the board has been getting cleaned, observe snow level next to the structure to the right, to get an idea of fresh snow. We’ll try to be more obvious about when the board gets cleaned. Weird date stamp on today’s image, but the caption date on the thumbnail is correct. We be working on it.